Before the Futura came along, most bike manufacturers – with a few notable exceptions – didn’t take sports tourers seriously. The approach was to take the cutting edge sports bikes of a few years back, sling on budget suspension and brakes, and sell them cheap. Aprilia’s approach was different. For starters, the company’s in-house design team used the engine from the 2000 Mille – their current sports bike – and cutting edge (for the time) Brembo Gold brakes. The modified Mille aluminium twin-spar frame had a rake of 25.6 degrees for stability with Showa forks adjustable for preload and rebound damping, though some markets got Marzocchi forks. The compression damping adjuster was blanked off as a cost-cutting measure. It also sported an underseat exhaust silencer, which allowed big panniers to be fitted without sacrificing ground clearance, and a fuel filler cap offset to the right to allow riders to fill the tank with the bike on the sidestand – a feature shamelessly nicked from BMW’s R1100S. The Mille engine was detuned for a wider spread of torque across the rev range and a greater flywheel effect, using Sagem fuel injection, and a catalytic converter – another rarity on a bike at the time – sat in a pre-silencer under the engine. All this helped change the character of the bike to smooth out a lot of the vee twin vibes, while maintaining its torquey character and a decent top speed of over 150mph. There were other little touches – part-digital LCD clocks (with blue backlighting); integral front indicators and mirrors; an ambient air temperature readout on the dash; of course a clock; and the panniers – originally an optional extra. And of course there was the seat, comfortable enough for two to ride all day, with a hump to keep the passenger away from the rider under heavy braking. The design team had clearly thought long and hard about rider comfort, but also pillion comfort and general ease of use. 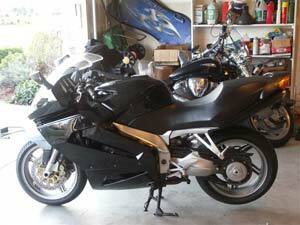 From its quiet exhaust note to its classy dash the bike oozed refinement. But the way the bike looked always divided opinion. 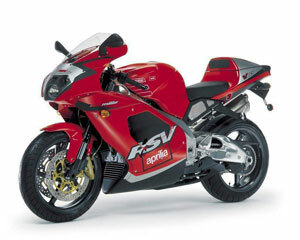 The first prototypes were exhibited at the various bike shows in autumn 2000, and slight cosmetic changes were made. Some of these prototypes later found their way into private hands and one in particular was shipped to the US and tested for homologation for export the Futura to the States. It spent a few years forgotten in the back of a warehouse before being rescued by Coug66 of the Apriliaforum. Next: So why did the Futura fail?